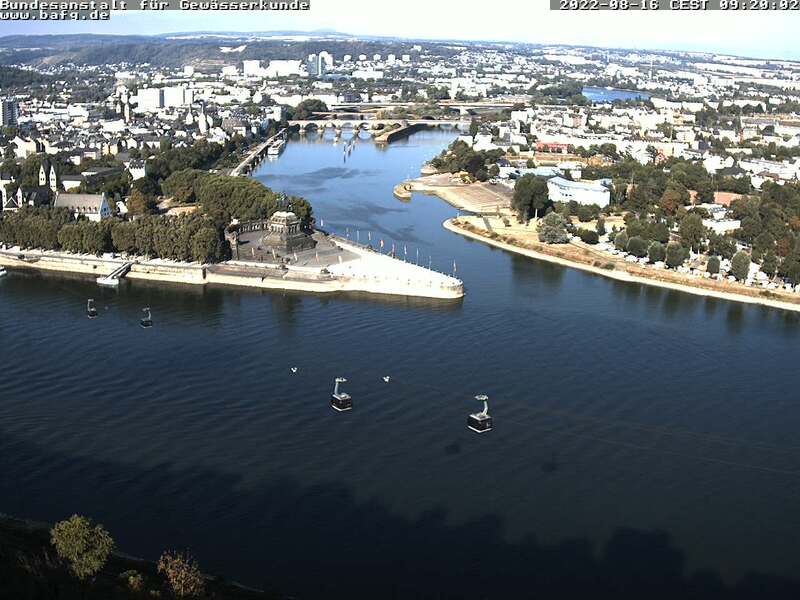 In Koblenz, the R. Moselle flows into the Rhine. Next to the R. Aare it is the biggest tributary of the Rhine and, apart from the Rhine itself, the second navigation lane. It crosses France, Luxemburg and Germany. Downstream of Trier, the Moselle separates the Eifel from the Hunsrück. 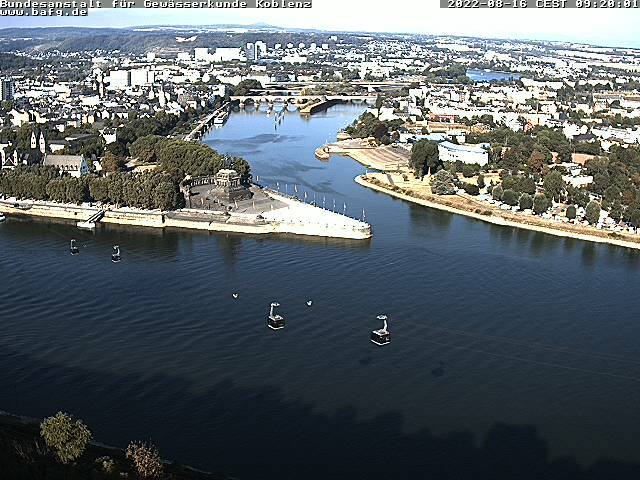 From Metz downstream to Koblenz the Moselle is impounded and transformed by 14 sluices. Since 2011, the lowermost barrage of the Moselle in Koblenz is equipped with a functioning fish pass. The Saar is the most important tributary of the Moselle. Another important tributary of the R. Moselle is the 173 km long R. Sauer flowing through Belgium, Luxemburg and Germany. Between Wallendorf and Wasserbillig the Sauer is a condominium, which means that the entire width of the river belongs both to the territory of the Federal German Republic as well as to that of the Grand Duchy of Luxemburg. "View from the Ehrenbreitstein fortress towards the Deutsches Eck"
The Saar flows through parts of France and Germany and pours into the Moselle at Konz (Rhineland-Palatinate). It has two source rivers (red and white Saar) at the Donon in the Vosges in Alsace and crosses Lorraine (126 km) and the Saarland (120 km) to which it gave its name before flowing into the Moselle 246 km downstream its source. The watershed of the Saar stretches across 7 43 square kilometres. The upper reaches of Saar and Moselle have largely maintained their natural character. that the Moselle wine growing area with its more than 6 000 ha is the largest single Riesling cultivation area of the earth? that, as early as the year 371 AD, the landscapes of the Moselle were already described to be “blooming and rich“? Decimius Magnus Ausonius, a Roman poet of the late antiquity and educator of the prince at the court of the emperor in Trier immortalized his travel impressions along the Moselle as far as Trier in his poem “Mosella“. hat the steelworks Völklinger Hütte on the banks of the Saar are the first UNESCO industrial monument? The listed parts of the former works for raw steel protection, the blast furnace and the blast furnace blower hall are “icons of industrial culture” and were included into the UNESCO list of human world heritage in 1994.